The light grew dim as the Maverick crew moved into the ruin. Ace followed behind the captain, looking around at their new surroundings as they went. From the entrance, the crew descended a flight of stairs into an open room that was almost entirely flooded, save for a narrow strip of the metal floor running through its center. As he crossed the room with his crewmates, Ace peered into the water, but it was far too murky to see how deep it went. “Anyone care for a swim?” the captain asked jokingly. As the crew advanced forward, Ace suddenly heard a splashing sound behind him. He turned just in time to see a terrifying plant monster rising up from a group of lilypads. The creature extended out its vines and latched onto Ace, pulling him toward the water. Ace struggled against it as it tried to take a bite out of him. “A Carnivine!” Cyrus shouted. The Maverick’s captain pulled out his pistol and fired a few shots at the Pokemon, severing its vines. Free from the creature’s grasp, Ace quickly backed away and reached for his own weapon. He took aim with his rifle and fired off a shot, hitting it right in its giant head. Axel seemed to have that one under control, so Ace turned his attention back to the other one. He raised his rifle once more and took another shot, taking it out of commission. Ace then turned back to help Axel out just in time to see a third one rising up. “Look out!” he warned his crewmate. Axel quickly jumped back as the Carnivine reached out for him, narrowly avoiding the vines. Unfortunately, that put him in reach of the other one. Ace unloaded a salvo of laser fire as the creature extended its burning vines toward the mercenary, taking it down before it could reach him. Axel nodded at Ace, then set his sights on the remaining Carnivine. “Ritsu, Ember!” the mercenary ordered his Pokemon. This time, the Charmander found her mark, setting the Carnivine on fire. Axel immediately followed up with a surge of flames from his flamethrower, completely burning the plant Pokemon away in a cloud of smoke and an eerie ghostly energy. “Hopefully that was all of them,” Cyrus said, scanning the water for more. As if on cue, another Carnivine sprung up out of the water. The Pokemon threw itself at Axel, but the mercenary was just out of reach and it flopped helplessly on the ground. While it was defenseless, Axel’s Charmander sprayed it with flames, setting it on fire like the others. As the burning Carnivine tried to pick itself back up, Ace and Cyrus unloaded their weapons on it, rapidly removing its vine limbs, one after the other. With three more well placed shots to the head, the captain finished the Pokemon off. Cyrus spun his pistol around his finger, then shoved it down into its holster. Ace looked around, checking to see if any more Carnivines planned on showing their ugly faces. After several moments, it was clear no more were coming. “Watch the rest of this place be crawling with them,” Axel grumbled as they moved into the next room. The crew stepped out onto a platform in a long, high-ceilinged room over a large vertical drop. Ace looked across to the far side of the room and spotted another platform, then his gaze moved downward to see the bottom of the room was completely flooded. “I think you might be right,” Ace said, looking over at Axel. He pointed out more clumps of lilypads in the water, a good six meters down. “You just had to open your mouth, didn’t you?” the captain asked. “We don’t have to fight them if we can find a way across,” Taraka suggested. “Well, I don’t think we’ll be jumping across,” Ace said. “So, how we gonna cross this, boss?” Axel asked. The captain’s chuckle became a full on laugh. “You can figure something out, right?” he asked, slapping the mercenary on the back. With that, Cyrus backed up through the door to get a running start. The Maverick’s captain sprinted toward the edge of the platform, then leapt off. Ace watched as he soared through the air and made contact with the ledge, grasping it with his fingers. Unfortunately, the metal surface was slippery with swamp slime, and the captain slipped. There was a loud splash as Cyrus fell into the water below. Ace looked down to see the captain swimming for the ladder. He also spotted a Carnivine rising up out of the water behind him. “Look out!” he called out, but it was too late; the Carnivine extended out its vine tentacles and wrapped them around Cyrus. 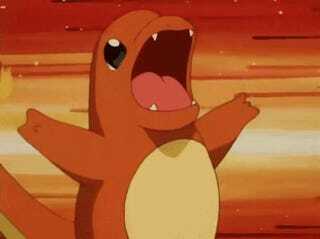 Jumping to action, Axel quickly released his Charmander. “Ritsu, Ember!” he commanded the Pokemon. As the Charmander spit out a jet of flame down at the Carnivine, Axel ran to the edge and fired off his own from his flamethrower. The sudden rush of flames from above caused the Carnivine’s grip on the captain to loosen. Cyrus quickly seized the opportunity by punching the Pokemon in the face, knocking it off of him. The Carnivine immediately tried to grab him again, but Ace hit it with a burst of well-placed shots from his rifle. He watched as the Carnivine sank lifelessly back into the water. Cyrus climbed back out of the water, then brushed off a few swamp plants that had hitched a ride on his coat. “Let’s not do that again,” he said. “If you try again, we can give you a boost,” Ace suggested. “Maybe there’s a button or something on the other side,” Axel said. He reached for a Pokeball and released his recently captured Gastly. “Scion, fly over to the other side and see if you can find us a way across,” he instructed the Pokemon. The Gastly floated off to the other side of the room, but he returned several minutes later with a confused expression on his face. Ace took another glance around the room, his attention this time falling on the vines hanging from the ceiling. “Maybe we could swing across on those vines,” he suggested, pointing to a series of four that could serve as a path across. Ace nodded, then jumped for the first vine. It swung forward from his momentum, and he leapt to the next, and then the next. As he swung from the final vine to the platform, it suddenly snapped. Vine still in hand, Ace sailed through the air and crashed down to the platform. There was a loud screech as his metal body scraped along the floor. “You alright over there? !” Cyrus called across the room as Ace picked himself up. “See if there’s a button or something you can drag over!” Axel shouted. Ace took a look around his immediate area, but there was no obvious button to extend a bridge or anything of the sort. Finding nothing on the platform, Ace ventured into the corridor leading out of the room. It was rather dim, but he was able to make out a set of stairs. Ace descended down to the landing where he found yet more stairs. Unfortunately, there didn’t appear to be anything of use. Not wanting to venture too far from his crewmates, Ace began climbing back up the stairs. As he made his way back to the platform, he looked around at the architecture. He couldn’t quite put his finger on it, but something about the place felt so familiar. He couldn’t help but wonder if these ruins were built by the same civilization that had created him. “Did you find anything? !” Axel called across the gap upon Ace’s return. “Hmm.” Ace took another look around and his eyes fell upon the vine that had snapped off from the ceiling. He walked over and picked it up. “Hey, catch!” Ace called out as he prepared to throw the vine. He pulled back his arm and then let loose with all his might. The vine flew a short ways through the air, then fell down into the water. “What if we just use a vine to climb up on that side? !” Axel suggested. Ace saw Cyrus point down at the Carnivines below and shake his head. “Do you think we can weave these vines together into some kind of bridge? !” Ace called out to his crewmates. “That could work!” the captain responded. Ace pulled out his rifle and aimed it up at the ceiling. With a few well-placed shots, he cut several vines down, then he began collecting them. As he was working on gathering enough vines to create a bridge, Ace suddenly heard a splash. He looked up to see Axel in the water, swimming over to his side of the room. “Axel, what the hell are you doing? !” Cyrus shouted. Seeing a Carnivine rising out of the water, Ace grabbed a vine and tied it around a broken support column, then dropped the other end into the water. He then grabbed his rifle again and began shooting at the Carnivine as it closed in on Axel. Axel ignored the Pokemon entirely, and kept swimming for the vine, but another emerged from the water in front of him. The Carnivine attempted to grab him, but its leaf arms simply slapped harmlessly on his back. Ace fired another volley of shots off, blasting off its appendages and sending it sinking back into the water. “Scion, use Hypnosis!” Axel shouted as he reached Ace’s side of the room. 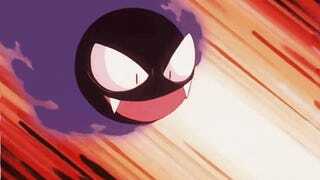 His Gastly swooped down and blasted the remaining Carnivine with hypnotic energy, putting it to sleep. With the Pokemon out of commission, Axel began swimming over to the vine Ace had dropped for him, but another one suddenly sprang up and latched onto him. As Axel struggled with the Carnivine, Ace tried to line up a shot, but he didn’t want to risk hurting his crewmate. 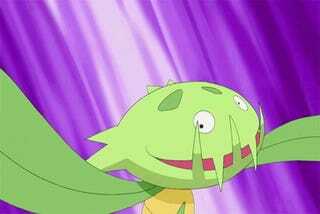 He quickly reached for his Ralts’s Pokeball and released him. “Blade, use Confusion on that Carnivine,” Ace commanded the Ralts. The Pokemon complied and unleashed a blast of psychic energy at the Carnivine, but it refused to let go of Axel. “Scion, use Lick!” Axel called to his Pokemon as he continued to struggle against the Carnivine. His Gastly swooped in and licked the Pokemon with his long ghostly tongue, distracting it and giving Axel the opportunity he needed. The mercenary broke free from the Carnivine’s grasp, punched it in the face, then began swimming away. The Carnivine responded by swinging a vine glowing with a shadowy energy at Axel. Ace quickly fired another round of laser blasts at the Pokemon, taking it out. The coast now clear, Axel swam over to the vine and climbed out. “Are you alright?” Ace asked as he helped pull his crewmate over the edge. “I’ll live,” the mercenary grunted. “Nice work, Peregrine,” Cyrus said as his Talonflame brought over the end of the vine rope that Ace and Axel had tied together. The Maverick’s captain then turned to Taraka. “Give me a hand with this, will ya?” he asked the monk. Taraka nodded and walked over. Together, the two men tied the end of the rope securely to a support column. “I think this will hold,” Taraka said as he looked over their handiwork. He wasn’t entirely sure for how long it would, however. “One way to find out,” Cyrus said. The captain climbed up onto the vine rope and began inching across. Taraka held his breath as he watched Cyrus cross the gap, hoping the rope would hold. He breathed a sigh of relief once he made it to the other side. My turn now, Taraka thought as he prepared to cross himself. The monk tried his best not to look down as he slowly but surely made his way across the gap. He was very glad once he was able to put his feet back on solid ground. “Let’s see what’s down there, shall we?” Cyrus asked. Taraka followed behind the captain and his crewmates as they made their way down the dimly lit staircase. After several minutes, they eventually emerged into a chamber with a narrow vine-covered bridge crossing over a deep, dark pit. Taraka peered over the edge and was unable to see the bottom. “That’s a long way down,” the monk commented. “Then we’d better hurry up and cross,” Cyrus said. “I don’t think it’s safe,” Ace said. “There could be more Carnivines.” He pointed at the vines covering the bridge and hanging down from the ceiling. With that, Ace began walking across the bridge. Axel was next, and he and his Charmander both crossed just fine. It seemed that the captain was right. Taraka and Cyrus followed their crewmates, but when they were halfway across, a vine suddenly sprang to life and wrapped itself around the captain’s leg. Cyrus let out a shout of surprise as he was ripped off the bridge. Moments later, the sound of a splash echoed up from below. “Are you still alive? !” Axel called down as Taraka quickly ran the rest of the way across the bridge. “Yeah, I’m still alive!” came the captain’s reply. “Are you alright? !” Taraka asked. “Should we jump down and join you? !” Axel asked. “Alright, be safe!” Taraka called down. “I guess we should keep moving, then,” Ace said. The trio pressed on into the ruin, moving through a series of corridors and then down another long flight of stairs. As they reached the bottom, they stepped off the stairs onto a mud-covered landing at the entrance to a large, open chamber that was almost completely flooded. On both the left and right side of the chamber, the water appeared quite deep, but a strip of much shallower water led through the middle, to a muddy “island” in the center of the room upon which sat some sort of metal object with a huge mass of vines surrounding it. The tendril-like plant growths extended out from the mass in all directions, leading out towards other parts of the ruin. Taraka got the sense that this tangled mass of vines was connected to all the vines they had seen on their way down. “I think whatever we came here to find might be inside that ball of vines,” Taraka said to the others. “Then let’s go get it,” Ace said as he began walking toward it. “What do you suggest we do then?” Ace asked. “Alright,” Ace said. He pulled out his rifle, aimed it at the mass of vines, then pulled the trigger. All the vines in the room trembled suddenly as the shot made contact, then a spooky pair of red eyes appeared, peering at the crew through the vines. Then, two large, red-tipped vine arms shot out from the mass. “This was a bad idea!” Axel shouted. “It was your idea!” Ace shouted back. “We’ll just have to fight it!” Axel shouted. “C’mon, Ritsu, let’s take this thing out!” The mercenary began running toward the Tangrowth with his Charmander by his side. He fired off a blast from his flamethrower, but the massive Pokemon blew the flames out with a sweep of its large vine appendage. Ace took a few shots at it, then threw out a Pokeball, releasing his Ralts once more.“Blade, Confusion!” he commanded the Pokemon. 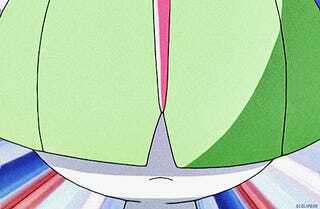 The Ralts moved up and shot off a burst of psychic energy, hitting the Tangrowth dead on. The attack only seemed to make it mad, as four more giant vine arms shot up from the deep water, wildly flailing around. 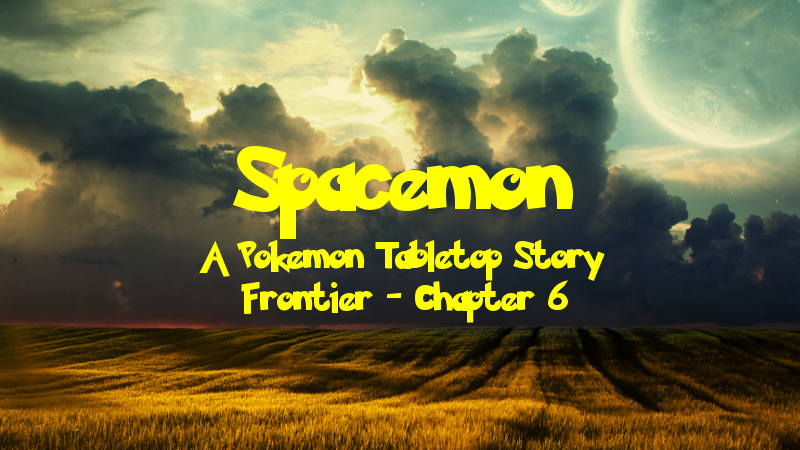 Taraka ducked as one swung overhead, but Axel’s Charmander was not so lucky and took a hit. Seeing what they were up against, Taraka threw up a psionic barrier to protect himself, his crewmates, and their Pokemon. He knew this was going to be a tough fight. The monk then released a Pokemon of his own. “Spooperz, use Night Shade!” he commanded as his newly captured Shuppet appeared. The ghostly Pokemon blasted the Tangrowth with her attack, getting its attention. The giant vine Pokemon responded by striking the Shuppet with one of its massive vine arms, the end glowing with shadowy energy. Spooperz went down from the powerful hit almost instantaneously. Next time, Taraka thought as he recalled his fainted Pokemon. “Ritsu, use Ember!” Axel commanded his Charmander as Taraka released his Ponyta. The fiery lizard spit out a jet of flame at the Tangrowth, and her trainer immediately followed up with one of his own with his flamethrower. The sudden rush of flames seemed to truly enrage the vine monster. It let out a horrifying noise as the vine arms sticking up out of the water moved in toward Axel and Ritsu. One wrapped around the mercenary while the other grabbed his Pokemon. Both were lifted up into the air as the Tangrowth began squeezing the life out of them. “Blaze, use Flame Wheel!” Taraka commanded his newly released Ponyta. “Hit that vine!” The fire horse charged at the vine arm holding Axel’s Charmander, completely coating himself over in flames. Blaze made contact, burning through a chunk of the vine arm, but it still kept a tight grip on the Pokemon it held. The Tangrowth responded in kind, extending another vine arm out to strike the Ponyta, dealing a heavy blow. Taraka was relieved to see that his Pokemon managed to stay standing. “Blade, Confusion!” Ace then ordered his own Pokemon. As his Ralts let out a blast of psychic energy, Ace took aim with is rifle and fired off a few shots. The Tangrowth raised one of its vine arms to deflect the laser blasts, but it could do nothing against Blade’s attack. Meanwhile, as Ritsu struggled to free herself of the vine clutching her, she managed to spray some fire in just the right spot. The Charmander’s flames finished the job that Taraka’s Ponyta started, severing the vine arm entirely. As soon as she landed, Ritsu rushed over to the vine holding her trainer and began spitting flames at it. As the vine arm continued to jostle Axel around, the mercenary completely let loose with his flamethrower, spewing a massive stream of flames out. By some miracle, the vine arm moved him on just the right path so that the entire arc of flame hit the Tangrowth’s main body, setting it afire. The Tangrowth wailed in agony as the flames burned through its vines. The vine arm holding Axel then began to glow. Taraka could tell that it was trying to drain the life out of his crewmate; he knew he needed to do something. Here goes nothing, the monk thought as he pulled out a Pokeball. He lobbed it right at the burning mass of vines and it pulled it in. The four massive vine arms rising up from the water all went limp as they were disconnected from the Pokemon controlling them. There was a loud splash as the vines, along with Axel, fell back into the murky water. As Axel climbed back onto land, Taraka walked over to collect his capture. Welcome to the team, he thought as he placed the ball into an open slot on his belt. The monk then turned his attention to what his new Tangrowth had been surrounding. “Let’s let the captain figure that one out,” Ace said. “We need to figure out what happened to him first,” Taraka pointed out. The monk glanced around the chamber to see if Cyrus had found his way to them. The trio made their way across the chamber and through the door. After ascending what felt like a rather long spiral staircase, they arrived in yet another large, open chamber. This one was devoid of mud and water like the last one and extended far above to a round opening revealing the sky. The light from the opening shone down upon a raised pedestal in the center of the room, while a faded mural stretched along the wall, across the entire room. “Man, there’s nothing here,” Axel grumbled. “I wouldn’t be so sure,” Taraka told his crewmates. His senses were telling him that there was something there in the room, something important. He felt drawn toward the pedestal. The monk approached, stepping into the light shining down from above. Taraka stepped up onto the pedestal and gazed around the room, his eyes scanning the mural as he turned. Then, suddenly, the monk felt his mind open as he was struck with a powerful vision. Notes: And there we have it, our first long chapter. For this session, I felt it made the most sense to make the whole session one chapter since it was a dungeon crawl. We ended where we did in the previous session since I needed time to design the dungeon, and I’m very glad I had the time to do it. I thought it turned out very well. I did forget to start the recording again so I had to piece together what happened in the beginning combat and change a few details, but it still turned out nicely. My plan for this dungeon was to fill it with Pokemon that would grapple the players and drag them into the water to drown them. Unfortunately, I rolled like garbage the entire time. I think only about 20% of the grapple attempts were successful, and those that were never got the chance to start drowning anything. And then my dungeon boss got wrecked so hard when Axel got a critical Flame Burst off. It’s entire second health bar just evaporated instantly. As for special things in this dungeon, both the Carnivines and the Tangrowth were Grass/Ghost type-shifted since it fit the vibe of the planet. They were fun to build. Novi ended up running late and missed the first half of the session, arriving just after the party had crossed the vine rope they made, so that’s why he didn’t do much in this chapter before that point. I did insert some lines here and there for the sake of the narrative, however. To make up for the missing player, I had the captain help them out in combat since the dungeon was scaled for three players, but once Novi returned, I snatched him away since I needed to maintain that scale. You’ll find out what happened to him next chapter.